As I mentioned in my blog Is jQuery based UI Framework Obsolete, during one of my onsite support to a local Chinese customer, I discuss SAP UX strategy with their IT team. The team architect is a fan of Vue, who prefers to use Vue in their UI custom development instead of Fiori. Then I am curious about the advantage of Vue and plan to learn it in my spare time. As always a Vue Hello World must be finished before advantaged content is touched. Vue is another UI framework based on MVVM which has more than 48000 stars ( till 2017 March ) in Github and now has 77000 + stars ( 2017 December ). I will first finish development locally and finally upload the tested application to Netweaver running it as a BSP application. You should have some basic knowledge on nodejs, npm and webpack to follow this blog. 1. create a folder in your laptop, type “npm init” in command line to trigger the generation of dummy package.json. Just directly press enter key to finish the creation wizard, so that all default settings are used for package.json. Type “npm install –save-dev webpack-dev-server” in command to install a light weight server which could be used for your local testing. The highlighted script is manually added to ease the local testing, which will be illustrated later. 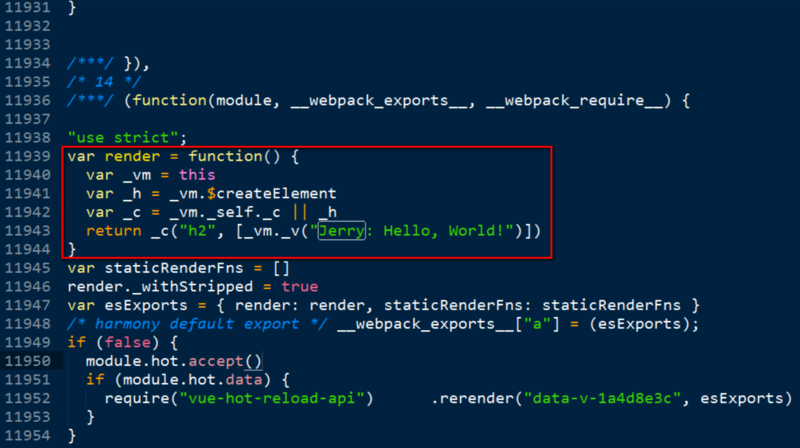 The HTML source code <h2>Jerry: Hello, World!</h2> under <template> tag represents the view part of this Vue application and will be rendered in the final HTML page. The constructor of Vue in the source code will simply mount the imported Vue component( implemented in ./src/index.vue) into the given HTML element specified by id=”demo”. So create index.html and declare the div element with id=”demo”. So far the index.vue in folder src could never be directly recognized by browser, so a conversion mechanism from .vue to .js is necessary here. The converted js from index.vue is stored in file dist/build.js. The next step is how to define and trigger such conversion. 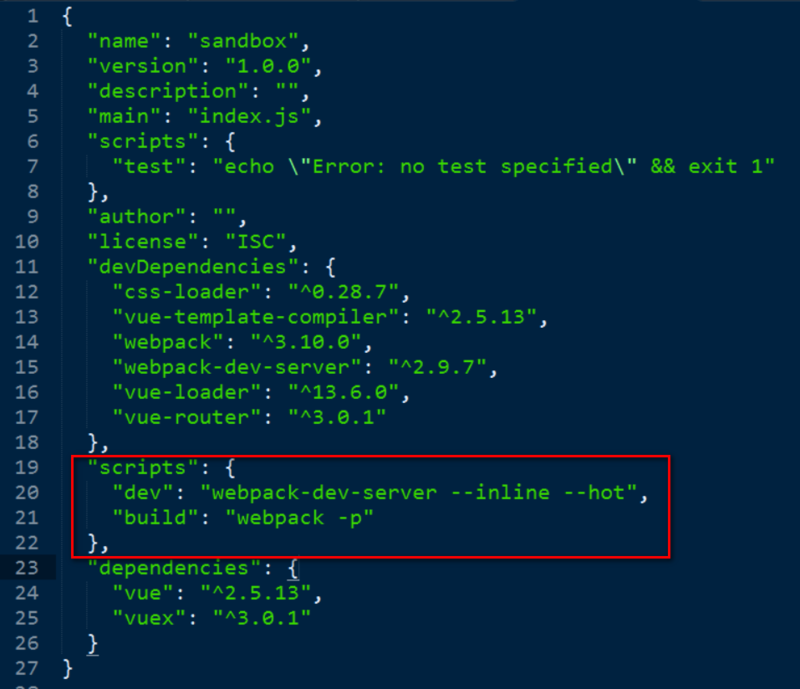 4. type “webpack” in command, and you can observe the build.js is converted successfully. 5. here now is the last step which is easiest for ABAPers: create a new BSP application in SE80, just import index.html and build.js, all other stuff mentioned before are only required in development time. i don’t know why no one commented 🙂 but i am seriously thinking that vue.js can overcome the performance issues of SAPUi5. SAPUI5 applications are really heavy especially when it comes to 60+ columns with sap.ui.table. Practically, building sapui5 applications might be faster but i am still searching a way of running vue.js application in sap netweaver. thanks a lot for sharing your experience. It is truly inspiring! I think Vue is the right choice. Lightweight, fast and easy to learn. After reading your articles i have decided to create a sample so i can make rest based Vue & axios apps on gateway and use them on Fiori launchpad. So, basically, i have created a BSP page to return Json (all biz logic is handled on R3 ERP and gateway just passes values between) and a vue html interface to consume that. Now, i do not need to waste time with OData and Fiori. I’ve done the same test with React/Redux and performance is really awesome comparing to SAPUI5 : thanks to virtual DOM (I think Vue JS is using the same thing) vs SapUi5-JQuery DOM.